ASK most New Zealand golfers their idea of the ideal winter golfing escape and the majority will say, “Queensland’s Sunshine Coast”. After all, it is an opportunity to swap numbingly cold New Zealand for guaranteed warm winter sunshine. Not only do they come for the great and plentiful championship golf, but also the wide variety of activities the destination offers along the lengthy stretch of bone-while beautiful beaches. Mind you, it’s not just the Kiwis that invade the Sunshine Coast during the winter months: golfers from all Australian states make the trek for similar reasons. Yes, on the Sunshine Coast tourists learn to focus on what is truly important. Contemplate, for instance, whether to play golf pre- or post-lunch. While away the hours on a beach or sit on the balcony overlooking an ocean or golf course and consider the merits of an afternoon glass of wine versus a cold beer versus a lemon squash. A massage may take your fancy. Take your time – there is no pressure to make hurried decisions. The goal here is to relax and enjoy the charm of this wonderful destination just an hour north of Brisbane. Between breakfast and lunch or lunch and dinner, one can swim, play golf, hike Mount Coolum or the Glass House Mountains, visit Australia Zoo or swim with the sharks at Mooloolaba’s Underwater World. If you’re not into thrill seeking, take a leisurely stroll around the Sunshine Coast Hinterland, Eumundi Markets or cycle the shoreline along the Caloundra Coastal Path from Golden Beach to Port Cartwright. A popular pastime is browsing the chic boutiques along Noosa’s Hastings Street or Mooloolaba’s Esplanade, shopping for crafts in Montville’s charming Main Street or wandering through the creek-side shopping centre of Maroochydore’s Sunshine Plaza. At night dance under the stars or enjoy a quiet, romantic meal on one of the many quality restaurants scattered up and down the coast. The golf resorts and clubs, too, offer top-quality dining facilities and welcome visitors. So, when you plan your next golf holiday and you decide you want to play courses the equal of any on the eastern seaboard of Australia, make plans to visit the Sunshine Coast. You don’t even need a passport. 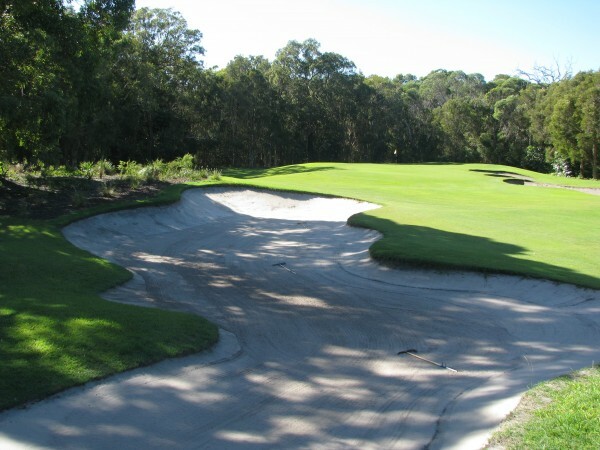 BUILT on natural rolling sand dunes, Bribie Island Golf Club’s championship layout offers golfers of all abilities the opportunity to play a sandbelt-style course while enjoying the sub-tropical weather all year round. The native bush-land and sandy lies off the fairways accentuate the need to position your golf ball on the well-manicured fairways and greens. Measuring over 6200m, the 18-hole (par 72) layout is one of the must-play courses in Queensland. It’s played host to many great tournaments including the 2012 Australian Junior Boys’ Championship, the 2012 Queensland Senior Men’s Championship and the 2009 Australian Senior Men’s Championship. Consistently rated in Australia’s top-100 public access golf courses and recently rated in Australia’s top-10 most underrated golf courses, Bribie Island will not disappoint. The club’s motto “It’s Worth the Drive” is apt. “When you come to play here you will find a big difference to a number of other golf clubs – serenity,” said club manager Steve Middleton. “We are not bordered by any roads, railway lines, airport or housing. At Bribie Island, there are plenty of good holes to choose from and all with different characteristics. The 18th hole is a great finishing hole, which leads to the clubhouse and outdoor deck. Measuring just 335m from the back markers, an accurate tee shot is required to set up an approach shot, but avoid the fairway bunker to the left. The green is well-protected and you need to be on the same tier as the pin. Avoid going long as the back bunker can be lethal. Many players have played out of the trap only to see their ball run off the front edge and into the gully or another sand trap – not a good way to finish. 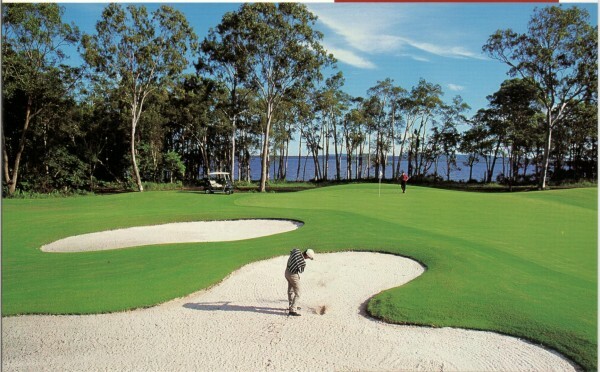 Bribie Island Golf Club is located halfway between Brisbane and the Sunshine Coast (one hour either way) and is the ideal detour or destination for those who appreciate good golf at a great price. Golf packages can be arranged and accommodation at Fairways Golf and Beach Retreat, just next door, is perfect. The club is open every day and Café on 18 is open for lunch daily and dinner Wednesdays through Friday nights. Contact the club directly for the best way to enjoy your getaway. IF you have never played golf at Horton Park Golf Club then we suggest you make a beeline for the golf course described as a “beautiful course in a beautiful place”. Located in the centre of Maroochydore and close to Sunshine Plaza, the curtain will come down on the course at the end of May 2015. The local council has resumed the land and the club’s loyal members will move to a new club and 18-hole golf course designed by Graham Marsh. Horton Park has been a favourite with locals and visitors since 1950 and was voted Queensland regional golf course of the year in 2005. One of the reasons Horton Park has been so popular is because it offers plenty of challenges – especially if the afternoon south-easterly blows in. The locals reckon holes 12 to 15 are the best four holes on the golf course. The greens and fairways are a treat, but if you do miss a fairway, the light rough can be punishing, which is the way it should be. One of the nice things about playing golf at Horton Park is that you get to use most of the clubs in the bag. Horton Park has a wonderful practice facility and driving range, which is open to members and visitors keen on honing their skills. 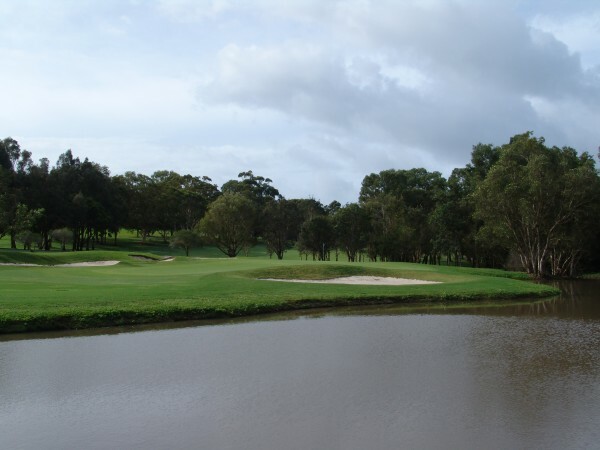 For five years, Horton Park hosted pre-qualifying for the Australian PGA Championship. Now that says something about the course and facilities. 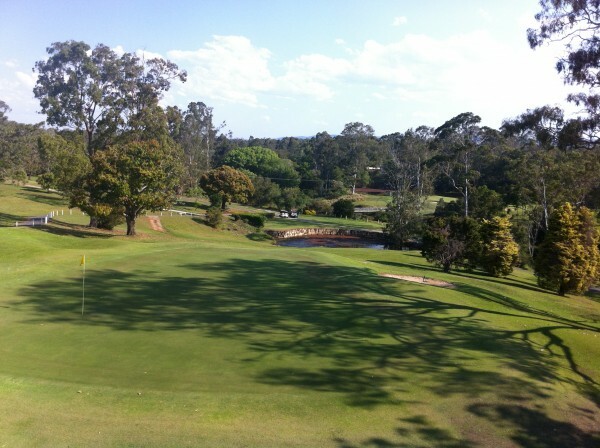 With a clubhouse that offers you everything from great food to great company, fully air-conditioned comfort, full bar service, a restaurant with sweeping course views open for lunch Monday to Friday and dinner Wednesday and Friday, Horton Park Golf Club is a must visit when you are on the Sunshine Coast. Just nine kilometres up the road, the new course is taking shape with nine holes fully grassed and the other nine holes being shaped. Weather permitting, the construction equipment will be offsite by the end of 2014 and the Horton Park green staff will be manicuring the course until it opens in June 2015. By no means does this mean the existing course will be neglected. The board and management are fully committed to maintaining the existing course in the superb condition the members and visitors have come to expect until the day the club moves. The new course, named Maroochy River Golf Club, has already secured two State title events in the first few months after opening and expectation are that there will be many more state and national events played at the course over the years. For many, it will be a sad day when the old course closes, but when the new course opens in 2015 it will be an exciting new beginning. THIS year (2014) marks the 50th anniversary of Caboolture Golf Club and like the proverbial fine wine, all aspects of the club’s operations continue to improve with age. Ideally located 45 minutes north of Brisbane and 30 minutes south of the Sunshine Coast, Caboolture is easily accessed from the Bruce Highway. Aside from majestic views from many holes, the course challenges golfers of all abilities with its elevated greens, undulating fairways, strategic hazards, doglegs and contoured greens. Visitors can enjoy the all-round Caboolture experience – a challenging game of golf, mid-round refreshments from the Can Bar and post-round festivities in the clubhouse. The club’s members pride themselves on their spirit of fellowship and invite visitors to share in an exciting golfing experience. The club provides many competition opportunities for members and visitors (Golflink number is essential), with weekend and mid-week competitions for men and women. Veterans play on Tuesday, women on Thursday and there is a nine-hole “meat Muster” throughout Friday. A two-person ambrose (no handicap required) is held on the last Sunday of every month. The club welcomes all social golfers with competitive deals such as two-persons and a cart for 18 holes on Mondays for $60 and discounted rates on every other day. Golf carts are available. Head professional Aaron Cox manages the well-stocked pro shop and is available for lessons at very reasonable cost by appointment. Fairway’s Bistro offers a full range of quality meals starting from $10 and the expansive members bar will quench any tired golfer’s well-earned thirst. Caboolture Links Room is a suitable venue for any function, including wedding receptions, seminars and training courses for up to 120 patrons, with a broad range of packages and breathtaking views of the course. Membership is open and there is no nomination fee. Annual ordinary seven-day membership is presently $795. Pro-rata membership applies to new applicants until the club’s financial year ends in September. Call the club on (07) 5495-1033 to book your round of golf and one of our 30 club carts. A NUMBER of course improvements including the new-look 18th hole at Headland Golf Club will pleasantly surprise golfers. New cart paths and dam extensions are just some of the changes, but it’s the 144m, par-3 18th hole that is attracting most attention. In years past, the infamous “Valley of Death” in front of the 18th green destroyed many promising rounds. Well, members and visitors are now breathing a sigh of relief when they reach the 18th tee for the “Valley of Death” is no more. Truckloads of fill from the dam extensions have “buried” the scorecard destroyer. The club’s general manager Ben Dobson said the hole is now more user-friendly. “But it’s still a fun hole with challenges,” he said. “A bunker awaits, long and left, for those that over-club while the large green has many tricky undulations despite looking relatively flat. Located in the heart of the Sunshine Coast, Headland is the club of choice that provides a challenging golf course whilst delivering highly satisfying golf and hospitality services to its members and visitors. One never gets bored playing the 55-year-old golf course and the views from the clubhouse are stunning. “The layout is undulating and in no way boring,” Dobson said. “Every hole has its own unique challenges and is a bit different. It’s a fun golf course. Headland, Queensland golf club of the year in 2009, is a friendly, welcoming golf club and, according to Dobson, has arguably the best greens on the Sunshine Coast. But back to the views from the comfortable clubhouse, which is open for lunch every day. Long-serving club pro John Victorsen, voted in the top-100 PGA or Australia pros of the last 100 years, reckons the list of places seen from the clubhouse, including the ocean, would fill a travel brochure. Course superintendent Ben Tilley, too, is an award winner taking out the Queensland Golf Course Superintendents Achievement Award for Excellence in 2011. The club has a lot going for it and the buzz around the 19th hole is infectious. One thing is certain – those golfers who regularly visited “Valley of Death” certainly won’t mourn her passing. I’ll drink to that – from the clubhouse deck, of course, where I can take in the breathtaking views. Located in the heart of Noosa, Noosa Springs Golf & Spa Resort features a stunning par-72, 6180m championship golf course carved into a natural bushland setting with abundant spring-fed lakes and bunkers guarding manicured fairways. It promises a challenging yet rewarding game for golfers of all ability and you might even spot a ‘roo or a rare Jabiru taking flight. They also boast Noosa’s only floodlit driving range open until 9pm Wednesday to Saturday. You don’t have to be a golf fanatic to appreciate all Noosa Springs has to offer: luxury accommodation, world class spa, casual and fine dining, boutique shopping, fitness, tennis, natural trails and more. Everything you could want for a relaxing, comfortable stay is available to you. Their fully self-contained two-bedroom apartments with king size beds can be configured to accommodate twin, triple and quad share. Their one-month Resort Membership is great value: stay in one of the luxurious two-bedroom apartments and play unlimited golf plus motorised cart for just $3980 (single) or $4880 (twin share). The package includes use of the fitness centre and heated swimming pool plus discounts on range balls and golf shop merchandise, spa and food and beverage. After a round of golf, hard hitters can ease the tension of weary muscles in the spa’s HydroMassage pool or the ultra relaxing flotation pool. Golf ‘widows’, too, can enjoy myriad spa therapies using organic skincare products. Their new Wednesday Wine Down series gives amateur golfers of any handicap a chance to win a brand new Toyota Corolla if they score a hole-in-one on the eighth. Register for the next round June 18 – just $79 per player including lunch and the chance to win plenty of bottles of wine on each hole. Women golfers will relish the popular Ladies Day Golf Series – $99 will gain you entry to the one day individual stableford competition followed by a champagne gourmet lunch, presentations and a fashion show: August 5 and December 2. Save the date for their major annual tournament, the 2014 Calvin Klein Queensland B&C Grade Championships 28-30 November. Played over three days of 54 holes of stableford play, it’s open to all amateur golfers with a registered B or C grade handicap. Entry is just $299. LOCATED just 15 minutes from Noosa’s Hastings Street and the same distance from the Sunshine Coast Airport, Peregian Springs Golf Club is the perfect golfing destination for any golf enthusiast visiting the Sunshine Coast. The golf course opened in 2003 and was designed by Adam Scott’s father, Phil Scott. The design of the course is challenging but fair with water coming into play on several holes. The signature hole is the par-4, 13th hole that measures 394 metres from the back tee with a large water feature on the right that is guarded by a waste bunker area running along the right-hand side of the hole. The second shot requires accuracy and precision to a large elevated green that requires you to carry the ball all the way onto the green. The Peregian Springs Golf Club welcomes visitors and guests seven days a week and has a fully-stocked golf shop as well as full locker room facilities and bar and restaurant services available to guests. The driving range is also open seven days per week and the club has a fleet of modern electric golf carts for hire. The clubhouse facilities are also available for conferences, weddings and other functions. IF you’re are standing in famous Hastings Street at Noosa, you are only 10 minutes from the beautiful Tewantin Noosa Golf Club. The championship course has been around for 77 years and it is in the best condition it has ever been. Over the years, Tewantin Noosa has hosted its fair share of big events including the Jack Newton Classic. The club has continued this tradition by continuing to host Pro-Am (Legends) events. More than 50,000 rounds are played by the members and a further 15,000 rounds by visitors. 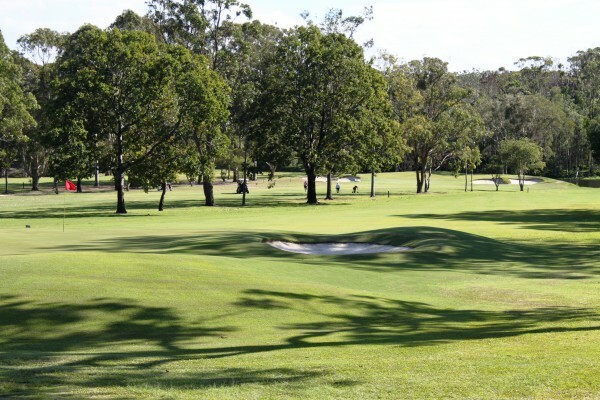 Tewantin Noosa Golf Club is popular with locals and visitors alike because it is an easy-walking and forgiving golf course, the par rating for men is 72 and ladies 74 with a slope rating of 126. The fairways are wide with a first cut then maintained rough so not too many golf balls are lost. Still, the course is no pushover and can challenge golfers of all levels. The true and fast greens are a reasonable size and a good target. Golfers can enjoy the tranquillity of the course’s natural bushland setting where friendly kangaroos roam. There are even koalas and an abundance of birdlife on the golf course. The club offers a fine bistro and relaxing deck to take in the superb view over the ninth and 18th. Secretary manager Allan Harris said the bistro is open seven days a week for lunch and golfers can also enjoy dinner there from Tuesdays to Fridays. 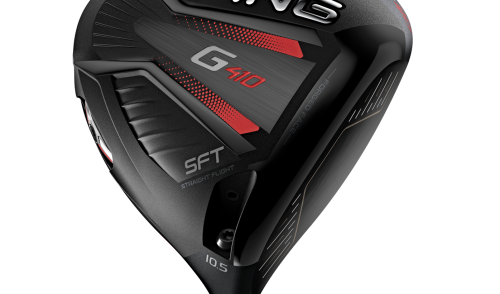 The pro shop is one of the biggest and best on the Sunshine Coast and boasts a comprehensive range of equipment, clothing, accessories and hire clubs. IF first impressions are important, it’s little wonder Twin Waters Golf Club is so popular and attracts plenty of repeat business. The club’s website proclaims, “Twin Waters Golf Club is a sportsperson’s dream and one of the top-six resort courses in Australia”. Well, I can’t argue with that. I have played this magnificent Peter Thomson and Mike Wolveridge-designed layout numerous times and I don’t think I have ever had a bad lie. The club’s award-winning general manager Steve Hutchison said the course superintendent and his staff keep the course in perfect condition all year round and I can’t argue with that either. It’s one of the reasons the PGA of Australia continue taking the Holden Scramble final back there – year after year. In fact, Twin Waters has hosted the Holden Scramble 16 times in the event’s 21-year history. The typical links-style layout replicates some of the traditional and natural British courses so appreciated by five-time Open Championship winner Peter Thomson. 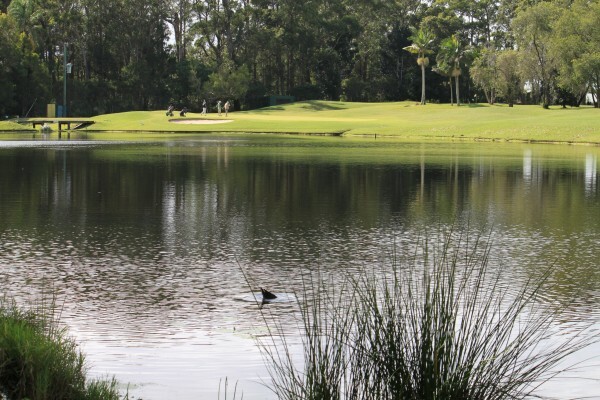 Situated at Mudjimba at the mouth of the Maroochy River just south of the Sunshine Coast Airport, Twin Waters has a stunning setting and the challenging layout combine to produce an enjoyable game of golf for all levels of players. Golfers who spray the ball off the tee need not worry because Twin Waters offers amply wide fairways, punctuated by rolling bumps and dips. Even when you hit your ball over bush-covered hills to the side of the fairway there’s a good chance you’ll find your ball and have a shot to the green. Concentration is critical on the putting surfaces because the greens are large with testing slopes. The 18th is a suitably testing par-5 and it’s a hole where many contests have been won and lost. The eighth hole is just one of the standouts because it has the green design in line with the “road hole” at the famous St Andrews. The water on the right is intimidating and should be avoided at all cost. A unique practice facility is the aquatic driving range, one of only a handful in Queensland. Twin Waters Golf Academy has you covered for improvement. 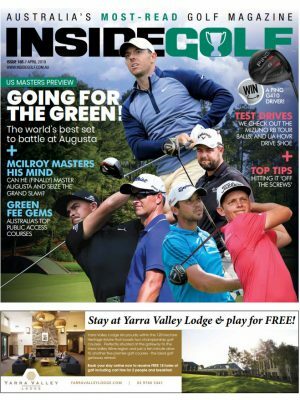 With highly-trained Australian PGA professionals on hand and great facilities on offer golfers will find the academy really is “the new era of golf coaching”. Mount Coolum Golf Club is quickly becoming the preferred course on the coast to hold state and national championship events as well as an ideal venue for corporate golf and charity golf days. 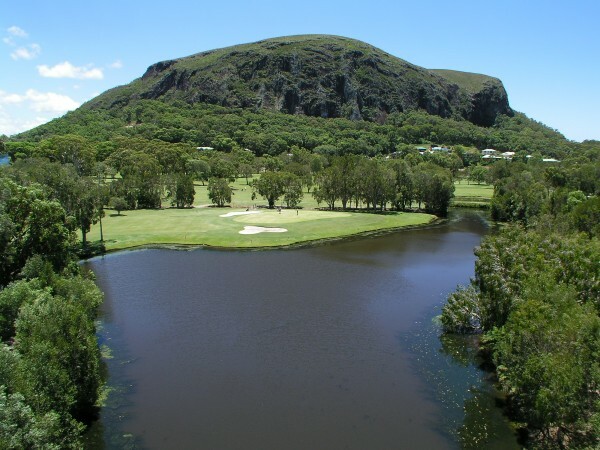 To play at Mount Coolum is to enjoy one of life’s great golfing experiences. Just a stone’s throw from the Maroochydore (Sunshine Coast) airport, the club offers easy access for interstate and international visitors and is perfectly positioned among various resorts and accommodation houses, which populate the Coolum area. The course is nestled at the foot of spectacular Mt Coolum with the rock providing an awesome backdrop on most tees and fairways. The picturesque scene is on par with most resort courses. The club is one of the friendliest on the coast and welcomes visitors of all golfing levels. To add to the beauty, the course is surrounded by an abundance of natural flora and fauna with water coming into play on 12 holes. Combine all this with the long, narrow fairways and you are swept away to another world where you can leave all your troubles behind and enjoy one of life’s great golfing experiences. The course layout is relatively flat, which makes it a comfortable walk for all ages and it comes as no surprise that more than 60,000 rounds are played here each year. 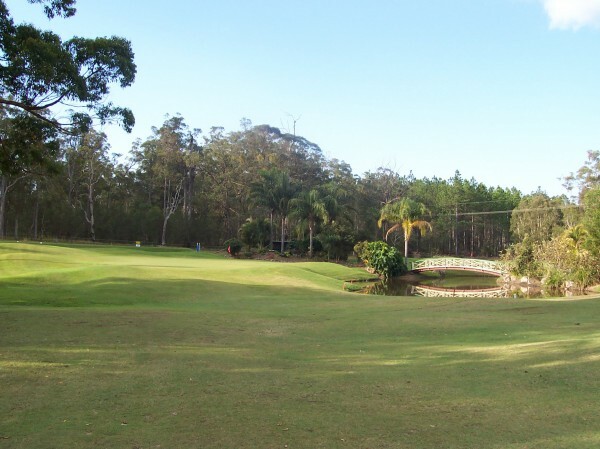 The course was also selected to host the 2014 Queensland Veterans’ State Championships, which gives another testimony to the ease of access and comfortable course layout. The club’s philosophy is to ensure members, guests and visitors receive the highest level of service and experience when attending the club or on the course. Secretary manager Sharon Purnell said the condition of the golf course was its best advertisement. “We have members and visitors constantly commenting on how well the course is playing and how professional and friendly the staff are,” she said. With the increased popularity in corporate golf, Mount Coolum Golf Club is an ideal place to hold a corporate event or trade day. With the proximity to Brisbane, the airport and accommodation, the club is well positioned to host local, state, national and even international corporate events. The pro shop recently increased the number of motorised carts to cater for the growing number of corporate functions and events. The club’s facilities include a fully-stocked pro shop with motorised carts, retail and hire equipment as well as the latest in men’s and women’s golf fashion. Club pro Stephen Jenkins has gained a PGA AAA and Level 3 coaching accreditation. The air-conditioned clubhouse has a relaxed and friendly atmosphere with a large deck overlooking the course and spectacular Mount Coolum. The Bistro is open for lunch Tuesday to Sunday and the bar facilities and gaming lounge is open seven days a week. Golfers can relax on the balcony after a game and enjoy lunch with views over Australia’s second largest rock – Mt Coolum. “It’s all part of one of life’s great golfing experiences.” Ms Purnell said. Mount Coolum Golf Club has social play on Monday, Friday and Sunday and offer discounts to social bookings of 15 or more players. The club welcomes visitors and guests to play and enjoy golf in the relaxed and friendly atmosphere. 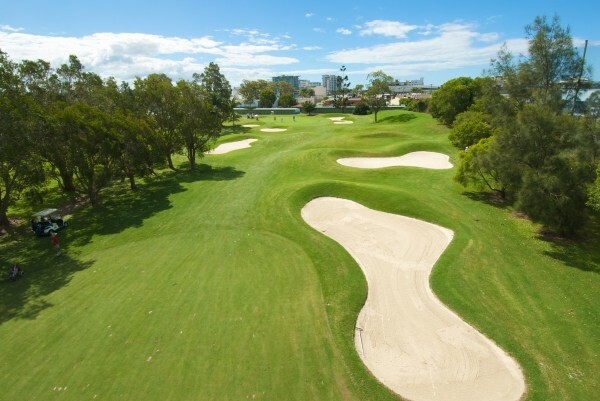 IN common with good golf courses everywhere, Caloundra Golf Club is very much a product of its natural surroundings. There is an aesthetic quality to Caloundra and a self-conscious reverence for nature. Established in 1951 in the popular seaside town of Caloundra, the golf course is set in a tranquil and peaceful environment. 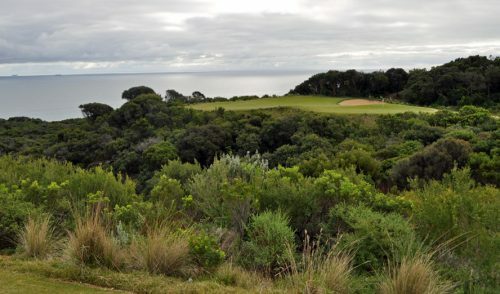 Of course, the challenge of the traditional Australian bushland course is another reason why the club is popular with members and visitors alike. The golf course is 5987 metres off the championship tees (5356m for women) and features a number of tight, tree-lined holes that make accuracy and the ability to shape the golf ball off the tee very important. There are five par-3s and they are a real test with none measuring less than 145 metres. If that is not enough, there is water on four holes and bunkers protect most of the greens. Caloundra’s final three holes are extremely demanding, which is what you want from a championship course. The 16th (353m) has an index of eight while the 17th (369m) and the 18th (393m) are indexed four and two respectively. If you require one birdie from one of the final three holes to win a title, you are going to have to work very hard. Caloundra Golf Club, which can lay claim to producing former Open Championship winner Ian Baker-Finch, has produced numerous state and national champions. Visitors are always welcome at Caloundra and social times are available most days. Motorised carts and golf equipment are available for hire. The clubhouse, which overlooks the 18th green and fairway, incorporates a fully-equipped bar and dining room while the pro shop has an excellent range of clubs and accessories. One of the attractions is each day at 4pm the Rainbow Lorikeets arrive and visitors are welcome to participate in the feeding activity. The Golfer’s Lodge is a set of two fully-appointed residences located on beautiful Bribie Island and within the confines of the award-winning Pacific Harbour Golf and Country Club precinct. 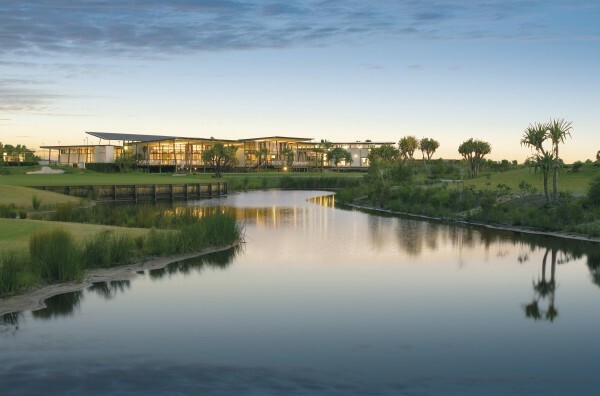 Overlooking the finishing green and adjacent to numerous resort-style facilities, including two floodlit tennis courts, 25m swimming pool, gym, spa and an aquatic driving range, The Golfer’s Lodge is set to become one of the most sought-after golfing destinations in southeast Queensland. Each of the newly-constructed residences contains two master bedrooms (each with an en-suite and spa) and a third bedroom, fully-equipped kitchen and living area, modern media room, outdoor alfresco area and a functional laundry. Ideally suited for overnight and/or extended stays, each residence comfortably caters for a group of four (four individuals or two sets of couples) or a family of five. The Ross Watson-designed Pacific Harbour Golf and Country Club provides a unique, award-winning, “island links” style 18-hole championship course with eco-friendly sub-tropical style clubhouse. Ranked as the Best Public Access Golf Course in Queensland for the fourth consecutive year, it offers all golfers an opportunity to play and experience one of Australia’s most challenging golfing layouts. The clubhouse, situated 100m from The Golfer’s Lodge, provides a relaxing atmosphere coupled with award-winning dining options. This unique golfing paradise and luxury accommodation is located less than one hour northeast of Brisbane at the northern boundary of Moreton Bay, uniquely nestled between a National Park and a Marine Park. In addition to playing at Pacific Harbour Golf and Country Club, The Golfer’s Lodge offers a number of golfing packages allowing guests the opportunity to play on nearby courses, including the award-winning Bribie Island Golf Club and the challenging North Lakes Resort Golf Club. For those interested in other pursuits, The Golfer’s Lodge offers access to Bribie’s very own Beauty Retreat for the ultimate day spa experience or simply kick back and enjoy the natural surrounds of Bribie Island. Airport transfers to and from either the Brisbane or Sunshine Coast airports can be arranged and, where necessary, golfing transfers to and from Bribie Island Golf Club and North Lakes Resort Golf Club can be included. 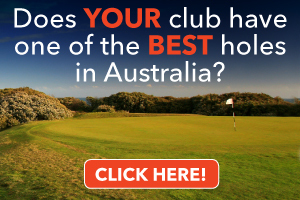 U Choose Golf Holiday specialise in Australian-wide golf destinations. 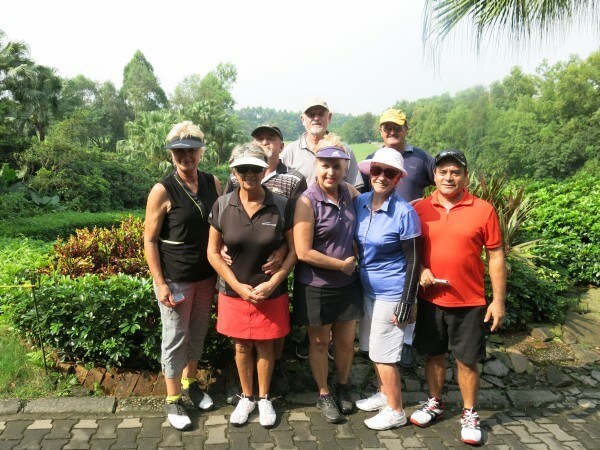 Owner operators Sharon and Gary provide golfers with a professional and well-organised golf trip – every detail carefully taken care of and nothing to do but turn up and have a great time. They take pride in offering good value and personalised service. Sharon, who looks after your holiday from start to finish, will tailor a package, provide choices of accommodation, courses and optional extras all designed to suit your requirements and budgets. “It’s definite value for money with no hidden surprises,” she said. U Choose Golf Holiday has been growing strong each year experiencing 80 per cent of loyal repeat customers. “The Sunshine Coast is proving to be one of our most popular destinations with a fabulous mix of accommodation and courses to suit all groups,” Sharon said. “You can choose from Caloundra to Maroochydore, Mooloolaba to Coolum Beach and Noosa, of course. Golfers can choose to play resort courses like Twin Waters, Peregian Springs and Palmer Coolum Resort as well as member courses such as Horton Park, Mt Coolum and others. 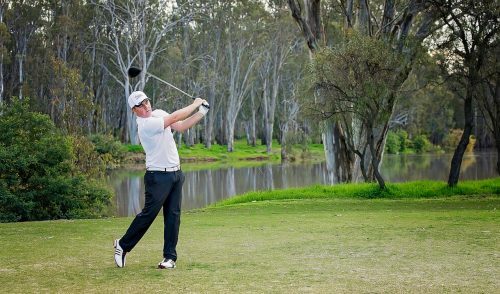 U Choose also offers golfers the chance to experience many NSW, Gold Coast, West Australia, Mornington Peninsula and the Murray River destinations. 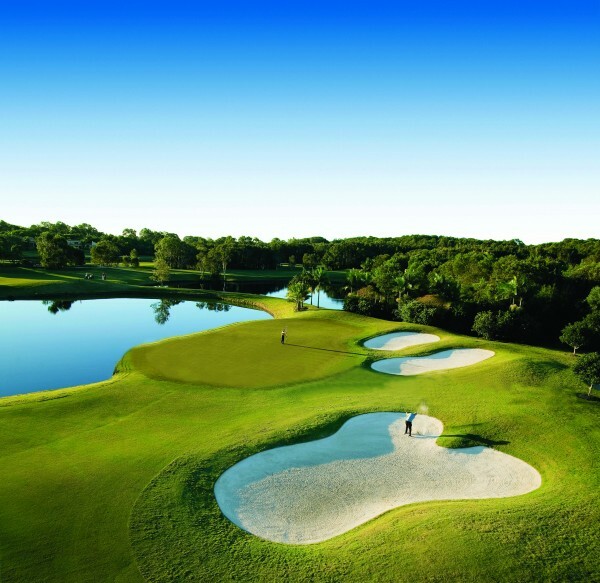 Clearwater Noosa Resort offers a one-stop shop for your golf vacation. Regardless of the size of your group, length of your stay or any other specific needs, they offer tailored packages to suit your group. They will even organize transfers, rental cars, vans or even buses for the larger groups. Just let them know your numbers and they will recommend the appropriate method of transport. Clearwater Noosa Resort offers a great location just metres from the famous Noosa River with its landscaped foreshore and picturesque shady picnic spots. A short walk from the Resort offers a multitude of restaurants, bars and cafes to socialise with your fellow golfers and friends. Packages are generally made up of 7 nights’ accommodation with 5 rounds of golf on a selection of the Sunshine Coast’s best Resort and Club Golf courses, including Noosa Springs, Twin Waters, Pelican Waters, Peregian Springs, Coolum Golf & Spa, Tewantin/Noosa GC, Mt Coolum GC, Horton Park GC, Headland GC and Caloundra GC. They can make up any number of combinations from the courses they use, and can adjust the packages to suit. The prices are based on any size groups, and they can arrange further discounts and/or some add-ons for groups larger than 12 people. ENGRAVED into the mind of a golfing traveller is the hope he might stumble upon an island paradise. A golfer seeking such a place should consider Pacific Harbour Golf and Country Club on Bribie Island, which is a 50-minute drive north of Brisbane and 30 minutes from the Sunshine Coast. The golf is far better than any traveller has a right to expect and golfers can play-and-stay with The Golfer’s Lodge virtually on the club’s doorstep. The Ross Watson-designed island links-style championship course is impressive as it merges island life, water and golf. Watson describes the course as “risk and reward”, which works well for championship, resort and club golf. 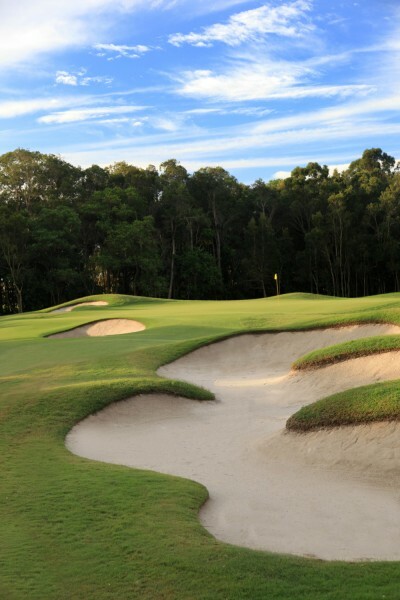 The bunkering at Pacific Harbour Golf and Country Club is a standout feature. The short holes (par-3s) are exceptional with the 17th having the longest bunker in the Southern Hemisphere. Water can be seen at every turn with reflective lakes, the ocean in the background and even the clubhouse is “floating” over a lake and aquatic driving range. The once lifeless stretch of land allowed Watson the rare opportunity to create a golf course in the spirit of golf’s Scottish heritage of seaside, links-style courses. Beach bunkers merge with lake edges with natural grasses, reed and sedges. The 250-metre aquatic driving range, putting green and practice pitching area are located adjacent to the 18th fairway. When Watson designed the golf course, he said it would be “challenging, memorable and visually attractive” and he’s right. IF you’re looking for good old-fashioned country hospitality at its finest, look no further than Woodford Golf Club, which is located 50 minutes by car north of Brisbane and 40 minutes west of Caloundra. Located in the Sunshine Coast hinterland, the scenic 18-hole golf course not only attracts inquisitive golfers but an abundance of wildlife that flourish on and around the golf course. The golf course is undulating, not hilly, and has excellent greens. It offers a terrific golfing experience and is well worth the drive. Speaking of drives, you’ll have to be on your game if you want to conquer the tough 429m, par-4 fifth hole. A hazard awaits down the left off the tee, out of bounds down the right and the second shot is played uphill to a narrow green. Still, there are a number of birdie opportunities with possibly the best chance at the 436m, par-5 10th. 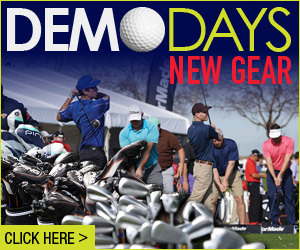 Woodford is a forgiving golf course and won’t deplete your golf ball stock. Once you get past the pond on holes one and four there aren’t too many other hazards. There’s plenty of wildlife, including kangaroos, on the course. It costs $28 to play golf Monday to Friday and $34 on weekends. The club’s House Manager Pat McAtee said golfers who turned up after 1pm Monday to Friday could play unlimited golf for $20pp and after 1pm Sundays for $22pp. The comfortable air conditioned clubhouse offers daytime snacks and sandwiches from Tuesdays to Sundays. Dinner is available in the Bunkers Bistro on Fridays from 6-8pm and a barbeque breakfast is available from 6.30am on weekends. Club pro Paul Cook is available for lessons. “We have arranged play-and-stay packages with the Woodford Village Hotel/Motel, which is two minutes down the road,” Mr McAtee said.